Have I mentioned that it's hot? We're not at 2003 levels, but it's mighty uncomfortable around here this week. The evenings are the worst, when the air is still and the sun's still shining at bedtime. Thank goodness it's not particularly humid. The best time of day is now, early morning. As I type this at 06h30, my thermometer says that it's 21ºC outside. That's about 70ºF, and it will likely be our low temperature for the day. Red grapes starting to turn. 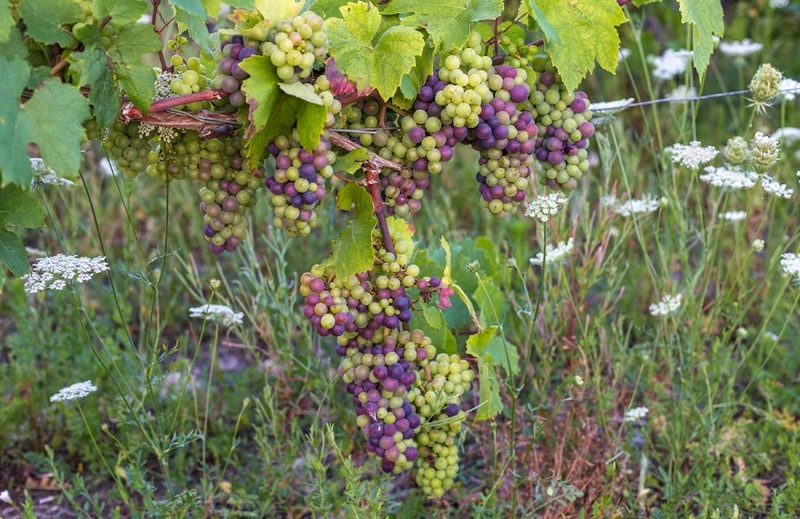 Meanwhile, out in the vineyard, the grapes are starting to ripen. There's a tractor outside this morning doing some trimming. I'm sure the growers want to get their day's work done before it gets too hot out there. There's no shelter from the sun out among the vines. I've been told that we here are not experiencing the heat wave hitting the rest of Andalucía. Whether we are or not, everyone is still complaining about the heat. 21 is warm for us for an overnight temperature even on a reasonably warm day. It would normally lead to a weather bust of some kind the next day. The historical average low temperature in the North Carolina town where I grew up is 23ºC at this time of year. Here in the Loire Valley, the historical average low temperature is 14ºC. The historical average high temperature in coastal N.C. is 31ºC from July 1 until August 31. In the Loire Valley, it's 25ºC. Ample rain in the winter/spring followed by hot dry weather would seem to me like ideal conditions for the grapes and the wine to follow. mitch, I assume you've got air conditioning in your place? andrew, it's extremely warm for an overnight low here, too. The weather people say the change will come by the middle of next week. Walt: Yes. We wouldn't be very pleasant without it. Don't get saucy with me, Bearnaise.